Butterflies are amongst the most captivating and attractive flying creatures on the planet. As a manifestation of its beauty and elegance, there are hundreds of thousands of butterflies collectors from around the world. Here’s a list of the largest butterflies in the planet. Two of them are from the Philippines. These winged-creatures are not just large they are also colorful and beautiful and they are among the most sought after species. Queen Alexandra’s Birdwing or Ornithoptera alexandrae is the world’s largest butterfly. It was named for Queen Alexandra, wife of King Edward VII of UK. Female species are larger than males with wingspan than can reach 31 cm and a body length of 8 cm. it can attain a weight of up to 12 grams. This gigantic butterfly can only be in the forests of Oro Province in Papua New Guinea. This species is critically endangered. The Goliath Birdwing or Ornithoptera goliath is the world’s second largest butterfly. It can only be found in New Guinea and has a wingspan up to 28 centimeters. The females are typically larger than the male like the Queen Alexandra’s Birdwing. The Goliath Birdwing takes an approximate 15 minutes to emerge from its chrysalis because of its large wings. The African Giant Swallowtail, which is almost as large as the Goliath Birdwing, is the world’s largest butterfly with a wingspan of 23 cm. It is scientifically named Papilio antimachus and is the largest butterfly in continental Africa. The female is smaller than the male. The butterfly has no natural enemies because it is very toxic, perhaps the most toxic of all butterflies. Buru Opalescent Birdwing or Troides prattorum is another large butterfly. It is almost as large as the Buru Opalescent Birdwing making it the world’s fourth largest butterfly. This butterfly is native to Indonesia in Southeast Asia. Palawan Birdwing or Trogonoptera trojana is a large butterfly native to Palawan in the Philippine. It has a wingspan of about 18 cm and flies the whole year. It ties with the Rippon’s Birdwing and Buru Opalescent Birdwing as the world’s 4th largest butterfly. Together with the Palawan Birdwing and Buru Opalescent Birdwing, the Rippon’s Birdwing is regarded as the world’s fourth largest butterfly. Scientifically known as Troides hypolitus, it has a wingspan of up to 20 cm. Chimaera Birdwing or Ornithoptera chimaera is a large butterfly that can be found also in mountain areas of New Guinea and the island of Java in Indonesia. It is usually found above 1000 meters above sea level. Females are larger than males and usually reach a wingspan of 18 cm making them the world’s 6th largest butterflies. Ornithoptera Croesus lydius is a large butterfly that can only be found in the Maluku Islands of Indonesia. 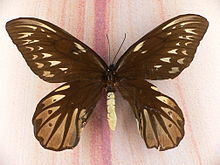 The price of a dead Ornithoptera Croesus lydius is worth $200. This rare birdwing lives in the forests of the swampy lowlands. The rich orange color on the males has made this a much sought after species. It ties with Chimaera Birdwing and two others as the 6th largest butterfly in the world. The Magellan Birdwing or Troides magellanus is one of the word’s 6th largest butterflies. This large and striking birdwing butterfly can be found in the Philippines and in Orchid Island of Taiwan. Obviously, this butterfly is named for the explorer Ferdinand Magellan who was killed in the Philippines in 1521. Sharing the honor for being one of the 10 largest butterflies in the world is the Miranda Birdwing or Troides Miranda. This birdwing butterfly can be found in Sumatra and in Borneo. Wow! Those are some big butterflys!